Let's Celebrate! Celebrating is a global language – it is something to cherish, whether it's a celebration of love, a milestone or a newborn, making merriments with those who mean a lot to you is within the very nature of being human. Planning a fabulous celebration can, however, strike fear into the hearts and wallets of even the most seasoned party-lover – something not lost on HOORAY!, the bi-monthly magazine that celebrates the art of entertaining. Capturing some of the world's most gorgeous and varied celebrations, Celebrate by HOORAY! is a publication that seeks to inspire future festivities, and give more people even more reasons to celebrate – without the need for a huge budget or access to a mansion. This isn't just any book however, just like the events it showcases aren't just any events. Celebrate is a 230 page mook – a magazine and book hybrid - featuring carefully curated events from around the world that showcase styling, atmosphere and celebrations that nourish the mind, the eye, the spirit and of course, the stomach. Celebrate showcases six categories of celebrations: love; birthdays; holidays; showers; and community, providing vital inspiration party planners can truly take hold of and translate to their own celebrations. From Halloween to baby showers, garden weddings to Valentine's parties, or birthday parties to fundraisers – the valley of inspiration within Celebrate is vast and designed to prove not only useful, but inspirational to event planners of all kinds. For HOORAY! editor Renee Douros, the need to produce the 230 page mook stemmed from the fact that 'some events are just too beautiful not to be showcased in such a gorgeous way – and that doesn't mean they are the most expensive or elaborate. Celebrate by HOORAY! gives amazing events from around the world their own platform, but does so in a way that anyone planning a celebration can take inspiration for their own event." For that reason, the mook serves as inspiration for décor but also deliverables – proving that hosting unique but achievable occasions is possible for everyone. 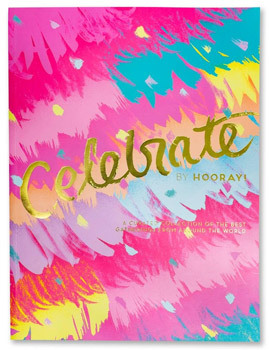 And to help readers even further, Celebrate launches with the perfect partner - Let's Party by HOORAY!, a smaller working book that serves as the ultimate sidekick to every party planner. For a list of available stockists please see here http://www.hooraymag.com/stockists/.